I have been blogging for about five years now, and it has helped me grow not just as a writer but also as a musician and teacher. A blog allows you to share updates with students and followers. You don’t need to have a super fancy website, but you should have some basic information. Your website is where you can direct potential clients and students. Today’ were going to talk about websites and blogs, and why you need one. With the growth of the internet, a website is becoming more and more important each day. Your website is a business card, a portfolio, and a storefront all in one. When networking, either online or in person, you can refer people to your website. You can upload recordings and other materials to your website. Even though you aren’t a “store,” you can still sell yourself with a website. As a musician, you are your product. You want to show the best side of yourself and show your various offerings. If you teach, create a page where people can learn about your lessons and studio. Composers can create a page with all of their music: sheet music, audio and video recordings, etc. Performers can upload photos and videos of performances as well as audio clips of their playing. Your website is a one stop shop for all things you. Websites are surprisingly easy to create. Web editors like WordPress and SquareSpace let you make a website in just a few hours. All you need to start is a name for your website, ideas for what to include, and just a bit of time. I personally use WordPress, and I love it. I can use the WordPress app to update my site on the go. If you buy your own domain and web hosting, WordPress also lets you use plugins which have different features that can help improve your website speed and security, or even add different forms and themes to your site. Other website makers have different options, so you can choose what works for you. However, I can’t recommend WordPress enough. If you’re hesitant about spending money for a domain (like example.com) and hosting, you can start with WordPress.com (the free version of WordPress), and move your site later. If creating a website is intimidating, there are plenty of resources out there, or you can even hire someone to help. I love creating websites, so if you need help (a little or a lot), let me know! Should I Pay for a Website? In the beginning, not necessarily. If you want to think long term, or you want a more professional look, then definitely. You wouldn’t walk into an audition in torn up, old clothes. Many people will get their first impression of you on your website, so you want your website to look good. If you’re on a budget, then you can give a free website a go. I had my blog and website for a few years before buying my own domain name. That allowed me to get the feel of running my own website without having to worry about paying for it. Then I transferred my website and domain to a paid hosting plan. If you’re new to the whole thing, consider using a free website for awhile. But its never too early to invest a bit of money into your website. Some website hosting costs as low as a few bucks a month. With the holidays slowly approaching, maybe add web hosting to your wishlist. That’s okay! You don’t have to be a writer to have a website or a blog. There are writers and editors out there that can help you create the website of your dreams. If you’re strapped for cash, some allow payment plans, or you can bargain some of your services to help them. As a musician, you could record background music that a writer could use in a video. You could create a jingle for the writer to use to market themselves. Or, you could even find a writer looking to learn your instrument, and you could give them lessons. I wasn’t always a writer, but now that I have been blogging for years, I am able to create written content that can reach more students. Creating a website and blog is not easy. It took me a lot of time to figure out what pages I needed. I have tons of archived blog posts with horrible writing. Just as with music, writing takes time to perfect. It takes practice. A website and a blog are both investments, whether you spend money on them or not. Yes you can get a website up and running in less than a day, but you will then have to continue monitoring your website, replying to comments, and sharing your content with potential clients and students. If you’re currently in college, that can make things even more overwhelming. Now, this isn’t a sales pitch (*side eye* I think this might be a sales pitch). I just want you to think about your career for a minute. Where do you see yourself in five years? Do you want to perform? Teach privately? Work for yourself in any capacity? A website will help with that. 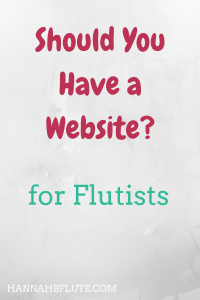 If you will be teaching K-12 music, then you might not need a website, but in most other cases, it will be helpful. A website will change the game. Do you have a website/blog? Do you use it? Are you happy with it? Do you want a website? Would you want to create your website or leave it up to someone else? Previous Previous post: What is Music Cognition?